In 1937, due to the pressure of debt, declining revenues, looming tax bills, and Hearst’s insatiable, virtually neurotic, appetite for art and real estate, financial calamity was no longer merely on the horizon. The wolf was now at the door. Washington power broker, and former chairman of the SEC, Joseph P. Kennedy, was retained to salvage the Hearst empire. Virtually everywhere he turned, the response was negative. Bankers scoffed at the bloated and unsound financial structure of WR’s properties. Investment bankers advised that the general public would not be persuaded to purchase additional Hearst stock. Kennedy decided on a strategy of issuing a series of modestly sized bond floats, each to be secured by a Hearst magazine or magazines, since public opinion of these had not been contaminated by the newspapers’ offensive editorial policies of the ‘30s. The bond issues were registered for public view, as was now required by virtue of the New Deal’s securities law reforms. When published, the registration statements were widely attacked by all of Hearst’s enemies and even by some of his former allies. Time magazine, ever a close observer and critic of Hearst, denounced the bond proposal, and so did a former friend, the American Legion. Critics pointed to the tottering condition of Hearst’s businesses, some claiming that the registration statements, in failing to mention the then ongoing, left-inspired boycott of all Hearst publications, were fraudulently misleading. At the end of the day, Kennedy was unable to find any normal means to re-finance the collapsing Hearst enterprise; with each passing day, bankruptcy and the loss of everything loomed larger. After fifty years of free-wheeling, no-holds-barred spending, all supported by maximum debt levels, faced with Depression-era economic conditions, Hearst’s reputation was such that no one would trust him with money anymore. The only way out was for Hearst to give up control of the whole enterprise. A trustee, Judge Clarence Shearn, was appointed to have full voting rights over Hearst’s stock for a ten-year term. Again, Hearst was fortunate. He retained editorial control of his publications and could look forward to a day when the American economy would turn positive and permit him to regain control after repaying the excessive debt now being carried by his companies. An ordinary firm in the same circumstances financially as Hearst’s would have been folded into the bankruptcy system and either liquidated or reorganized with a complete change of management. In the case of the Hearst empire, however, different financial dynamics were at work: being ultimately dependent for direction upon him, the companies had value almost completely dependent upon Hearst himself. In bankruptcy, Hearst would probably be stripped of all involvement in the judicial process; thus the bankers could not expect to do as well as they might with a trustee overseeing finance while Hearst continued what he did best, directing the editorial and personnel policies of the publications. Marion, learning in late April 1937 of the imminent collapse of WR’s world, bravely offered her personal assistance, instructing her business manager to liquidate her own considerable assets and, with the one million she was able to raise on the spot, insisting that WR’s financial manager Tom White accept the money. After considerable resistance, Hearst accepted Marion’s generous offer in return for a loan secured by one of the magazines. Sadly, Hearst was forced to order that all construction be stopped at San Simeon and that all but the essential maintenance staff be let go. The zoo was disbanded, its animals sold. As the Hearst financial crisis reached its peak, the undistinguished end to Marion’s film career was also playing itself out. From 1935 to 1937, after leaving MGM for Paramount, Marion had made three films, all failures. Late in 1937, a fourth film Ever Since Eve, likewise failed. Hearst, nothing if not consistent in his wrong-headed views of Marion’s rightful place in Hollywood, continued to blame studio personnel for failing to find the right material for her. Marion Davies’ movie career, and with it Hearst’s interests in film-making, were near their ends. He was now seventy-four and, though still healthy and active, he must have harbored some strong sense of disillusionment, disappointment, and regret as everything to which he had devoted such exceptional energy crashed down around him. Though the voting trust arrangement stripped away his financial control, Hearst maintained active editorial oversight of his newspapers, subject only to Judge Shearn’s absolute power over spending. None of the bankers, who were thoroughly familiar with Hearst’s incontinent spending via the leftist biographies then circulating, would trust Hearst with a cent, lest he spend it on art, houses or parties. His annual salary was deeply cut to $500,000; he was compelled to deed half of his vast art collection and one of his estates to the company; and, worst of all perhaps, in order to continue living at San Simeon he would have to pay rent and the non-business-related upkeep and maintenance costs of the establishment. The once seemingly endless flow of guests back and forth between Los Angeles and San Simeon was virtually dammed up; those guests who did come were not from the old, high-maintenance, Hollywood crowd. In the end, a series of auctions were held to dispose of half of his art collection, a cache of treasures built up over fifty years of buying, the mere sorting, cataloging and pricing of which took nearly a year of non-stop effort. Many of the pieces Hearst had not even seen except in photographs. Commencing in March 1938 and extending over a two-year period, the auctions were staged so as not to flood the market; at the last stage of these sales, when the estate was down to the less valuable pieces, the trustees arranged for certain department stores in New York City to display these last pieces for sale to passing customers in the stores. Made fun of in New Yorker cartoons, these cheap department store sales were the final stitches in the garment of public humiliation hung on Hearst. As his customary good fortune would have it, Marion, retired from films in 1938, proved to be a loving, comforting companion for Hearst in his agonies. All reports were of her watchfulness and anxiety for WR in his time of trouble. On the other hand, no longer busy with work, Marion now could indulge her drinking habit ever more assiduously. Nurses whom Hearst hired to oversee Marion and her alcoholic condition ended up, at Marion’s constant behest, supplying her with booze. On top of all his other woes, there was the continuing question of the boys. Bill, Jr., the second eldest, was the only one who had found his own way in the world of work. The other two older sons, George and John, were proving ne’er-do-wells and were now exposed to ruin since Hearst’s power to protect them within the organization was severely diminished. They were at risk of the usual fate befalling men who cannot keep a job. Though the public, now fully aware of both Hearst’s old age and his ongoing business crisis, expected him to fade away or soon die, and though the bankers fervently hoped for the same thing in view of his constant meddling in their plans as chief cog of the entire outfit, Hearst himself had other plans, soldiering on with complete editorial control of his publications. The bankers balked at Hearst’s full-throated use of his bully pulpit to carry on an isolationist, anti-English crusade as events in Europe raised the question of right and wrong among the contesting nations of Western Europe. World War II was not too distant, with Japan on the march in Asia and Germany asserting itself in defiance of the post-WWI order. Hearst believed in keeping America out of the ongoing conflicts, with the added fillip that, contrary to Rooseveltian views, Germany and Italy could not be blamed for desiring to restore a balance of power in Europe more appropriate to their rights as nations than that which had been imposed by the Treaty of Versailles which England, France, and Roosevelt wished to maintain. When his bankers protested that a more even-handed approach, moderating his critique of the British, would be better for business, Hearst, in high dudgeon, defended his editorial independence and declined to compromise his editorial policy. Unlike the financial crisis of 1923, when Hearst did temporize on the question of municipal ownership of San Francisco water supplies in order to placate the bankers who could provide the financing he desperately needed, Hearst did not sacrifice his personal integrity in 1938-1939. Perhaps, by this time of his life with Marion, there was no longer any question of her devotion, no longer any question of desperately needing millions and millions to sustain an extravagant way of life for her benefit. The financial pressure that afflicted WR, his wife and family, in addition to the poignant dismantling of his flagship, San Simeon, also resulted in Millicent’s pitiable entreaties to her husband for an increase in her monthly allowance, usually in the relatively minor, by their previous standards, amount of $1,000, entreaties that Hearst was forced to reject. Hearst himself issued similar letters to the trustees, virtually begging for an increase in his salary, letters which they in turn rejected. The boys, even in the Hearst jobs they managed to keep, were not paid much, certainly too little to live as heirs to a great fortune. Hearst’s request to the bosses that Millicent be given a job editing one of the magazines where he believed she would do well writing about home decorating and architecture, was also met by rejection by Richard Berlin, head of the magazine division. Berlin noted that Millicent was already on payroll for $2,500 a month, somewhat below the radar of the trustees, but that a request for an increase might backfire and lead to her being completely cut off. Not until 1945 would Hearst regain control of his empire. In the meantime, war and relative poverty forced the closing of San Simeon and the retreat to their Northern California estate Wyntoon for WR and Marion. By 1942, Marion had long since abandoned the party girl life that she had enjoyed during the 20s and 30s. Now 45, and Hearst over 80, Marion tended toward more domestic pursuits: making silk ties for WR by hand and participating in both charitable events and the war-preparedness activities of the invasion-fearing Californians of the time. The two kept a passel of dachsunds who were dear to them and who were their constant companions, as if they were children. 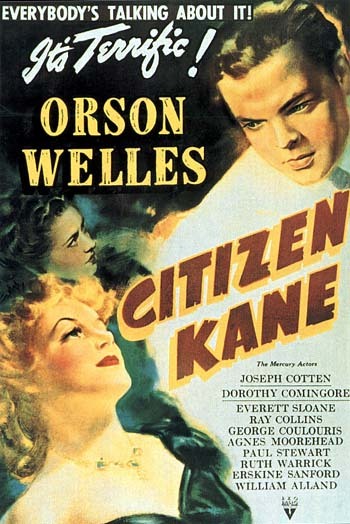 In 1941, the film Citizen Kane was released by RKO, the noted stage director Orson Welles making his film directorial debut. Kane turned out to be an unpopular, money-losing film, tricked out as fiction but still accepted as an account of the lives of Hearst and Davies. Under pressure from Hearst’s representatives, the film had been heavily edited, cut to make fewer factual references to Hearst’s life. Nonetheless, it was all but accepted as fact by the public and Hollywood that Welles had intended the film to reflect Hearst’s life, and, what is more, to cast Hearst in an unfavorable light. By today’s sensibilities, we would call the film a shameless exploitation of two famous people and perhaps ripe matter for a libel action. It was, in effect, a National Enquirer piece, blown up into a feature film, with the important distinction that the ordinary man in the street often finds National Enquirer material interesting and stimulating whereas the first viewers of Citizen Kane came away bored. When Hearst first became aware that the film depicted the tycoon’s mistress as an untalented singer on whom he spent millions to promote her career in opera, all the powers of his presses were trained on RKO and Welles. Hearst would have found it quite impossible to stand by and permit Marion to be publicly humiliated in this fashion. The scheduled opening of the film at Radio City Music Hall in New York City was cancelled when Hearst’s long-time faithful agent, Louella Parsons, personally threatened both to cease press coverage of the Music Hall and, for the benefit of the Rockefeller family who owned the Hall, to expose the underside of John D. Rockefeller’s life should the opening take place. Welles was attacked ad hominem, particularly for the active role he then played in the American left, branded a communist sympathizer in Hearst’s publications. The record is bare of any active involvement by Welles in communist party activities, though he was clearly in the most liberal wing of the Left and consorted with many who were active Party members. This was enough “proof" for Hearst, who seems to have taken the view that, if Welles had made an execrable fiction of Hearst’s reality, then WR would make an execrable reality from the fiction that Welles was a communist. Not that there was a moral equivalency here, since Welles’s treatment of Hearst’s life, though not necessarily in good taste, was within the bounds of the rules of the communications game; it was, after all, only a movie which the public could expect to be fictionalized and exaggerated. Readers of Hearst’s newspapers, on the other hand, had a right to expect unfictionalized accounts of events, which, in the case of Hearst’s attacks on Welles, they did not get. Again, in standard Hearstian style, when his personal interests, and especially his loving personal interest in Marion’s welfare, were at stake, journalistic objectivity suffered. Adding to the threats emanating from the Hearst side, some have also claimed that he threatened to put an end to his newspapers’ hands-off policy concerning the occasional report of dastardly acts committed in Hollywood, such as rapes perpetrated by directors and the like, Hearst allegedly providing dozens of examples of misdeeds that had not been reported in his papers. On finally making its heavily edited, low-profile opening, Citizen Kane proved a popular failure but was praised by the intelligentsia of the time, who by and large were either leftist or media competitors of Hearst. By dint of its original reception by critics as a work of cinematic art, Kane attained its undeserved cult status as film art. One watches the film today and is baffled by how far its reputation exceeds its actualities. Where works for the stage can afford to evoke gloom and pessimism and to be distractingly complex, qualities sometimes appealing to an audience of elite modernists, works for the screen that exhibit these same qualities end up in the dustbin of film history. The essential difference between reality and art in Kane is that, though Welles vented his leftist spleen in portraying his “fictional" tycoon as an empty, disillusioned, and foolish loser, the flesh and blood Hearst was a towering optimist, regardless of circumstance, a devoted lover and one of the great winners in American history. Alas, Kane’s view of an untalented mistress with a career propped up by her lover’s unlimited financial support does tend to hit rather close to the mark, rather more closely than generally acknowledged. Certainly, Marion herself would not have denied the resemblance, though, as a matter of fact, neither she nor Hearst ever saw the film. When a copy was sent to him by RKO to enable his review of the edited version, the canister containing the film was returned unopened. As Hearst always advised Marion, “never pay any attention to the bad reviews." Welles had quixotically believed that taking up the life of Hearst in a muckraking manner would advance his career. Of course, nothing could have been further from the truth; had he been less the romantic idealist and more like Marion’s putative suitors, who might coo and bill with her in the Chief’s absence, but who scurried away like rats when Hearst was afoot, his career might have prospered instead of evolving into an undignified magic act on television. With the advent of World War II and the subsequent revival of the American economy, the Hearst media empire began generating sufficient revenues to dig itself out of the its financial morass. Advertising income rose and a new source of revenue was born, the licensing of Hearst cartoon characters from the Sunday supplements. At the age of 82, in 1945, WR got back control of what remained from the crisis: seventeen newspapers, nine magazines, four radio stations, the Sunday supplement, and two news/feature services. Marion and WR returned to San Simeon and resumed the long-delayed construction projects that Hearst was so fond of, much as if the events of 1937-1944 had never happened. Rounds of partying resumed as well though on a more subdued basis, smaller in scale, perhaps reflecting WR’s being 83 and Marion herself 48 in 1945. By 1947, Hearst was no longer in the best of health, suffering heart problems sufficiently serious to necessitate their leaving San Simeon and setting up their establishment in Beverly Hills, closer to health care facilities that he might need. He could no longer use stairs easily and his daily editorial work, once astoundingly rigorous, gradually began to decline. By 1948, having trouble using the phone late at night to call his New York editors, and thus requiring Marion’s help, the Chief still bubbled over with thoughts, ideas, suggestions, and guidance, as he had for more than sixty years. He still didn’t care about his editors’ sleep requirements, but his physical limitations were beginning to multiply. Marion’s role in purportedly conveying the Chief’s instructions to his editors became problematic; with even her admitting that, from time to time, she liked to inject her own “two cents" into editorial matters. At one point, she directed the Los Angeles Examiner staff to mount an editorial defense of film star Ingrid Bergman, who was then under public scrutiny due to her openly conducted love affair with Roberto Rosellini and her giving birth to his child while still married to another man. When the editorial was pulled by one of the attorneys, Hearst personally called the lawyer responsible to advise him never again to disobey an instruction from Marion. As matters wore on, no one on his editorial staffs could tell whether the instructions, written or telephonic, they received in the Chief’s name were actually his or some diluted, contaminated version. With death clearly on the horizon, Hearst set about extending his life-long goals even beyond the grave: first, he sought to bequeath his properties in such a manner that Millicent and the boys would not be tempted to divvy up the empire and sell its parts for the immediate cash required to support their well-demonstrated tendency, endemic among the Hearsts, to spend money like very well-off drunken sailors. His second goal was to provide the maximum amount of comfort for Marion, whom Hearst knew would be scorned by all after his death. The first postmortem ambition, maintaining the integrity of his empire, was effected in 1947 with the drafting of a complex will establishing trusteeships, to be composed of five family members and eight independent trustees, trusts that would not dissolve until the death of the last grandchild alive at Hearst’s death. Millicent and the boys were provided for separately, by means of other trusts holding enough preferred Hearst stock to provide modest but sufficient income to them for the rest of their lives. As for Marion, the 1947 instrument granted her a trust holding 30,000 shares of income-generating preferred stock, the same amount that the five boys received together. She was also given the Beverly Hills mansion. Secretly, in 1950, and probably prompted by the increasing level of conflict between Marion and the boys over her alleged meddling in Hearst’s instructions, a lawyer separate from the Hearst family legal team was hired to establish a trust that would give Marion sole voting rights over the stock held in the trust established in 1947, thereby devolving upon Marion the same rights to control editorial policy, hire and fire and make financial decisions that Hearst himself enjoyed while he lived. This arrangement, when it became known for the first time in 1951, on Hearst’s death, stunned Hearst’s family and business associates who, even in death, could not rid themselves of Marion and the primacy she held in the heart of William Randolph Hearst. By 1950, Hearst’s failing health and Marion’s ambiguous role in the editorial process were creating chaos. Infamous in the 1930s and 1940s for their anticommunist tirades, the Hearst editors in 1950 were allying themselves with Senator Joe McCarthy, offering Hearst reporters to assist him and sharing Hearst files with the Senator’s staff. In April of that year, a cable with WR’s signature was sent out to his principal editors stating that, in view of their newspapers’ “hammering" communism for so long and irritating readers, it was time to moderate coverage of the left for awhile and take stock of the “international situation." Given WR’s lifelong, steadfast pursuit of strongly anticommunist policies, we are hard pressed to understand the motivation for this communiqué. Historians have attributed to Hearst a change of heart, some kind of deathbed conversion. Much more likely, especially in view of that notorious occasion in 1923 when Hearst similarly issued a “moderation" directive regarding the fight over ownership of water supplies in San Francisco, the directive having as its principal aim to mollify the bankers he needed to save his ailing empire, some external pressure on Hearst must have induced him to alter his course on the subject of communism. And the probable source of that outside influence would have been Marion. Her extensive network of Hollywood friendships, her only support outside of the aging Hearst, would no doubt have importuned her to persuade Hearst to let up on the papers’ participation in the McCarthy anti-communist crusade. Hollywood was ground zero in the Senator’s bombardment of the left, making it quite possible that Marion’s numerous friends in that milieu would have turned to her for help on the public relations front. All that being said, the record itself is bare of evidence that Marion played any role in the reversal of stance by Hearst; however, not every important historical event, such as sometimes vitally significant private conversations among lovers, friends and business associates, is fixed in writing. A mysterious event like Hearst’s “lay off the communists" memo of 1950 can sometimes only be explained, if explicable at all, by a reconstruction of the private motives and conversations of the historical actors. Marion’s memoirs The Times We Had show us she herself had no political inclinations, that she was almost purely a social creature who took her opinions, to the extent that she held any fixed views, from her immediate circle. In this case, the pain caused to her Hollywood intimates by McCarthy’s persecution in the press and on the floor of the Senate would have caused her to suffer empathetically. Combined with her already established emotional influence over Hearst, especially as his powers were reaching their nadir, there is a high probability that it was Marion herself and not the old but enfeebled warrior Hearst who was the responsible party. In any event, Hearst’s son Bill, Jr. took it upon himself to intervene in the controversy, and, after a personal meeting with WR, issued a “clarifying" note to the effect that the earlier instructions from his father did not, in fact, carry the implication that the newspapers should make any material alteration to their existing editorial policies. This sequence of events, marking the first time in editorial memory that a Hearst order had been effectively countermanded, established in the minds of Hearst editors that, though he indeed remained as lord of his domain, he was no longer to be regarded as controlling their editorial direction. Hearst’s invalid condition worsened throughout the rest of 1950 and 1951. He had difficulty speaking and stopped attending Marion’s dinners downstairs, meals which by this time were but the palest imitations of the grand affairs of days gone by. Marion suffered her own incapacities: she was drunk most of the time. Intermittently, Hearst could issue lucid editorial guidance that was clearly his own work and not Marion’s. Once, however, having given his Los Angeles editors an order to write a piece on the Pasadena Playhouse (Marion’s suggestion? ), he angrily called the responsible editor to the mansion in Beverly Hills to berate him for failing to publish the asked-for article. The editor, no doubt scared stiff, gently showed Hearst the edition containing the piece as ordered. The old Chief apologized, blaming old age and illness for his mistake. He was 88 and virtually on his deathbed. Very shortly after this last incident, the top staff members and Bill, Jr. took matters into their own hands, setting up shop in the Beverly Hills mansion, bringing with them a retinue of doctors, nurses, various family members, friends and children. The formally polite, and sometimes friendly, relations that had marked Marion’s relations with the Hearst boys came to an end. Open conflict broke out, with Marion incensed at all the noise and hubbub that she felt was interfering with WR’s rest and peace, while the family was outraged in turn with her drinking and her meddling in the newspapers’ affairs. On August 14, 1951, following a particularly vile argument between the warring sides, Marion was sedated. While she lay unconscious, her lover of thirty-four eventful years, William Randolph Hearst, greatest of the American newspaper magnates, 88 years of age, died at 9:50 on that morning. An incisive summary of Hearst’s inimitable career was provided by Alva Johnson, writing in 1932, and contrasting Hearst as journalist with another great publisher of the era, Adolph Ochs of the New York Times. Where Ochs viewed himself as a purveyor of information, Hearst had come before his readers “as a minstrel and sage, ethical guide, social coach, financial advisor, confidant and strategist in affairs of the heart, culinary tutor, educator, house mother, prophet, purveyor of warm data on high life….Every day of his life, he strives to exert his influence to the utmost." Marion was still unconscious when he died; she woke up later in the day to an empty house: the entire encampment had picked up and left, taking Hearst’s body with them to San Francisco for burial. She was devastated at the icy treatment visited upon her by people she had known intimately for more than thirty years. She must have taken some comfort, even in her grief at losing Hearst and at essentially being left for dead herself, that, unknown to the Hearst cabal, she was now their boss. By the terms of the 1950 secret trust agreement, she was now legally in control of the Hearst empire. Had the cabal been aware of this inconvenient fact, perhaps they would have shown her at least the minimal respect due the woman who had loved the Chief, cared for him devotedly as he was dying and even once sacrificed her own personal wealth to save his companies from ruin. Once the mid-August funeral, with its lying-in-state and huge procession of dignitaries, was complete, Marion arranged for her friend Hedda Hopper to make it public that Marion had become heir to Hearst’s controlling interest in the vast media empire, a bombshell announcement unhinging the clique of family and friends whose only aim was to cut Marion out as soon as possible. Soon, the big legal guns were brought out. There were two legal questions and at least one very large practical question, the latter being, of course, how someone of Marion’s background, education, capacities and interests would fare when placed directly in the shoes of the titanic W.R. Hearst. Marion herself never failed to minimize her own talents; according to her, she was surely no newspaperwoman and barely an actress. The enormous, unbridgeable chasm between Marion qua Marion and the role of press baron, obvious to all including the lady in question herself, provided a good basis to discuss settling the dispute between Marion and the family without resort to the courts. No doubt when the secret trust had been drawn up, Hearst would have assured Marion that he indeed was aware that she would never actually take his place at the helm, but that the bequest would give her the leverage necessary to extract concessions from the family, especially with respect to that part of his main will giving her the Beverly Hills mansion and the large block of preferred stock. Hearst and Marion could envision a battle in probate concerning possible “undue influence" exercised by her on Hearst. Given the spectacular effect that the secret trust would have on Marion’s foes in the family when it became public, Hearst could well have calculated that the family would be happy not to oppose those terms favorable to Marion in the main will if that was the cost of avoiding loss of the entire empire. There may also have been a legal challenge to the unusual long-term trusts that Hearst had set up to maintain the integrity of his media organization; by their agreement with Marion not to challenge the main will, the other heirs would have given up any challenge to the other trust arrangements as well. Since Hearst seldom, if ever, revealed his inner thoughts or intentions in any written form, we can only speculate on all the strategies he employed in his testamentary dispositions. We can conclude, however, that the strategies all succeeded. Both Marion and the empire would be secure. The two strictly legal questions regarding Marion’s rights were as follows: first, whether the 1950 trust, established in the midst of the considerable physical suffering that Hearst was experiencing, may have been the product of undue influence on Marion’s part, and, second, whether Millicent, still Hearst’s legal wife, had an overriding community property claim under California law. Both of these questions could very well have been litigated to uncertain results for many years. Marion, never a fighter to begin with, graciously yielded her claims under the 1950 trust in exchange for the parties’ agreeing not to contest the 1947 will, together with Marion’s being hired on for some time as a consultant for the film side of the business. We can be certain, that whatever Marion’s duties would be as consultant, they surely would not involve the editorial policies of the newspapers. Marion’s financial future was secure, just as old Hearst would have wished; she kept the mansion and the $150,000 in annual income that would be generated by her block of preferred stock. Somewhat oddly, the next day after announcement of the settlement, October 31, 1951, Marion married. The Las Vegas wedding, virtually an elopement, was held very late at night, with the license showing her age as 45 though she was in fact 54 years old. The misstatement of fact was either a remnant of the lifelong charade that she and Hearst had carried out to obscure their true age difference when he courted her as a teen, or it was simply a lady’s wile to keep her suitor in the dark on the question of age. Perhaps it served both purposes. The lucky man had started out courting Marion’s sister Rose but had not succeeded in that endeavor, subsequently becoming friends with, and a regular visitor to, both Marion and Hearst. His name was Horace G. Brown III, a merchant marine captain who, Marion mendaciously asserted, was a Hearst cousin. The marriage took place barely two months after Hearst’s death, widow’s weeds apparently not being one of Marion’s preferred costumes. Having just lived in an unmarried state for some forty years, the hasty marriage to Captain Brown cannot readily be explained as necessitated by Marion’s strong preference for marriage per se. So what were her reasons for doing so? And for making the legal union such a public event? Had Brown been her lover even before Hearst died? He was a fairly constant presence at the mansion, making that a possibility; on the other hand, they could easily have remained unmarried lovers for some time to provide a decent-looking mourning period for Marion. Did she intend to figuratively slap the Hearsts in the face by disrespecting their beloved pater familias and thus gain some measure of revenge for the family’s studied, ice-cold rejection of the part she had played in WR’s life? By the timing of the marriage, one day after settlement of the estate, we can suppose that Marion knew the hasty marriage would aggravate the Hearsts and endanger the final settlement of the estate in her favor. Therefore, she might well have taken this step out of spite. It is also possible that Brown himself was a kind of fortune hunter and eager to lasso Marion into the earliest possible marriage. This, however, seems highly unlikely in view of the fact that the initial object of his affections had been Marion’s sister Rose, a woman without substantial means of her own. For an ordinary man like Brown, it proved difficult to be married to a woman who had been spectacularly spoiled and pampered her whole life and who was far richer than he was. Though they stayed together until Marion’s death, it was a volatile relationship. Her huge social life, the remains of a life composed almost wholly of rounds of parties, particularly annoyed him. And, of course, like Hearst, he was not of the Hollywood tribe and probably a very poor air-kisser. Marion augmented her wealth with real estate projects and watched her old friends die. She must not have carried forward the spendthrift ways of her life with Hearst, since her estate was valued at twenty million when she died. Joseph Kennedy, always an admirer and friend, kindly invited Marion and her husband to attend all the Kennedy family weddings. Her own health slipped away quickly during the 50s, a process culminating with the discovery of bone cancer in 1959. She was admitted to a hospital in May 1961 and put under the care of three cancer specialists flown out to Los Angeles from the East Coast by Joe Kennedy. Notwithstanding, she died in her hospital bed on September 22, 1961. She was sixty-four years old. Her daughter by Hearst, their secret child, Patricia Van Cleve Lake, was at her bedside. Marion is remembered, among other ways, by the Marion Davies Clinic, a treatment center in West Los Angeles that she had funded while she lived. As for San Simeon, their palatial castle of love, it is today a popular and profitable tourist site run by the State of California; there is always a waiting list to visit the mansion. Except for the 100,000 acres bought by the U.S. government during the war, the immense “ranch" surrounding La Cuesta Encantada continues on as a cattle ranch.